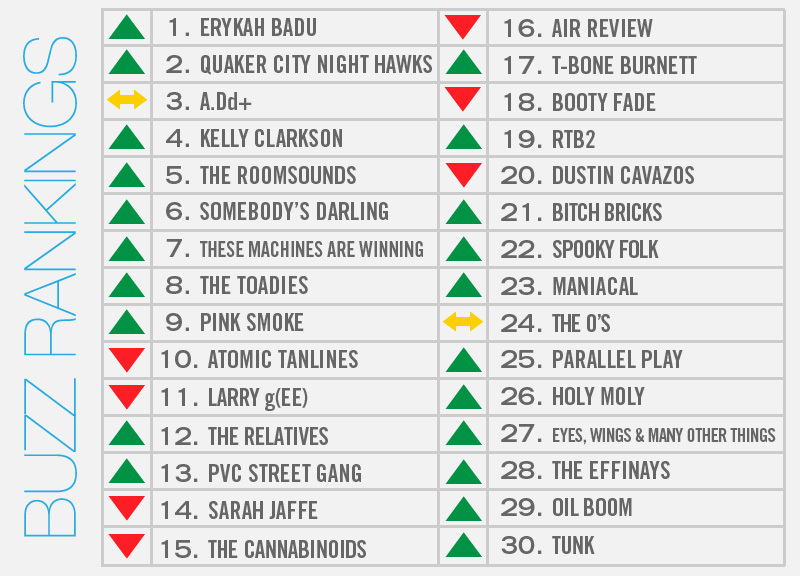 Don't Tell Me, Erykah's Back On Top This Week. Each week, we take a survey of the local music scene and try to determine which acts in town are really putting in work and seeing it pay off. Which bands have the most intriguing shows coming up? Which bands are getting the most press around town? Which bands have accomplished the most notable feats of late? Based off these criteria, three of our music writers submit a list to be weighted and compiled into a master list revealed each week in this here space. We like to think it's fairly revealing. Sixteen years ago this past Monday, Erykah Badu released her debut album, Baduizm, and almost single-handedly popularized the sounds of neo-soul while simultaneously thrusting the budding genre into the commercial spotlight. With that release, Badu earned herself a pair of Grammys for Best R&B Album and Best Female R&B Vocal Performance. From there, the Queen of Neo-Soul has only kept on rolling, remaining culturally relevant while still embracing her Dallas roots as often as possible. As one of the city's biggest icons and ambassadors, it only makes sense that she'd appear as a guest on NPR's weekly Wait, Waitâ€¦ Don't Tell Me quiz show when they decided to tape last weekend's episode at the Winspear Opera House. It was also during that broadcast that host Peter Sagal first mentioned that Badu would be performing a hometown concert on her birthday. But Badu wasn't the only multi-Grammy-Award-winning local songstress in the spotlight this week. At this Sunday's Grammy ceremony, Kelly Clarkson took home her third career award, this time in the Best Pop Vocal Album category for her song “Stronger.” Her down-to-earth, off-the-cuff acceptance speech and her highly publicized Ellen DeGeneres photobomb also helped Clarkson become one of the most endearing pop stars in the entire country this week. Case in point? The New York Daily News wrote this week that, “Clarkson might have had the most fun of all the celebrities at the Grammy Awards on Sunday night,” in a feature they wrote on the singer. Add to the extra bit of attention the Burleson native has garnered of late her cover on last week's issue of People magazine. But last weekend was full of big non-televised performances as well: A.Dd+, The Roomsounds, and Larry g(EE) held things down quite nicely at our one-year anniversary party at Sundown; Somebody's Darling impressed at the Kessler; These Machines Are Winning lived up to the hype at their live debut and CD release show at Double Wide; and PVC Street Gang, Spooky Folk and RTB2 made sure this year's Lumberjack Fest in Denton was maybe the best one yet. Meanwhile, the Effinays showing at Trees Saturday night helped that band earn a slot on this year's Wakarusa Festival lineup in the Ozarks this summer. This all speaks to a trend we're looking forward to continuing this weekend, as Fort Worth favorites Quaker City Night Hawks are releasing both their sophomore studio LP Honcho and a new 7-inch containing a pair of cuts deemed “too heavy” to fit on the album at Magnolia Motor Lounge on Friday night. That Funky Town bar, which was also the location where their 2012 live EP was recorded, has become something of a home base for the Night Hawks in the past couple of years. All we're saying is it should be a pretty packed house.